This is a great new freebie that has come available. Get yourself the new free Vaseline lotion samples. 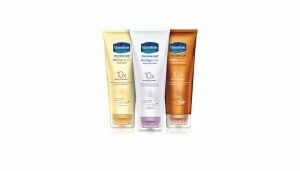 These are of the Vaseline Intensive Care healing serum lotions meant to moisturize even the driest skin. This is back by the Vaseline name so you know that it must be good. At the very least this is great to put in a guest bathroom for your visiting guests. It is always nice to have a fresh bottle of lotion to use after a shower. Hurry in and request yours while it is available. Use the following link if you are trying to access this through a mobile phone.